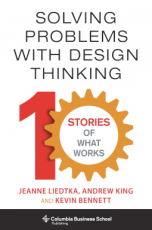 Design-oriented firms such as Apple and IDEO have demonstrated how design thinking can directly affect business results. Yet most managers lack a real sense of how to put this new approach to use for issues other than product development and sales growth. Solving Problems with Design Thinking details ten real-world examples of managers who successfully applied design methods at 3M, Toyota, IBM, Intuit, and SAP; entrepreneurial start-ups such as MeYou Health; and government and social sector organizations including the City of Dublin and Denmark's The Good Kitchen. Using design skills such as ethnography, visualization, storytelling, and experimentation, these managers produced innovative solutions to problems concerning strategy implementation, sales force support, internal process redesign, feeding the elderly, engaging citizens, and the trade show experience. Here they elaborate on the challenges they faced and the processes and tools they used, offering their personal perspectives and providing a clear path to implementation based on the principles and practices of design thinking.